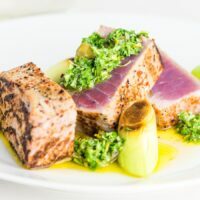 This vibrant and zingy lemon caper sauce is the perfect accompaniment to this quickly seared tuna steak deliberately cooked very rare and just warmed in the centre. A meal guaranteed to impress on every single level! Tuna Steak With Lemon Caper Sauce. Yes folks more tuna and a rather foxy and fancy looking Seared Tuna Steak with a lemon caper sauce. Unlike my last Asian inspired tuna steak recipe this one is much more ‘European’ in its influence. The sharp lemon caper sauce loaded with fresh parsley is perfect at cutting through and complimenting the tuna. Tuna is such a versatile fish, rich and full of flavour, perfect for standing up to bold flavours. 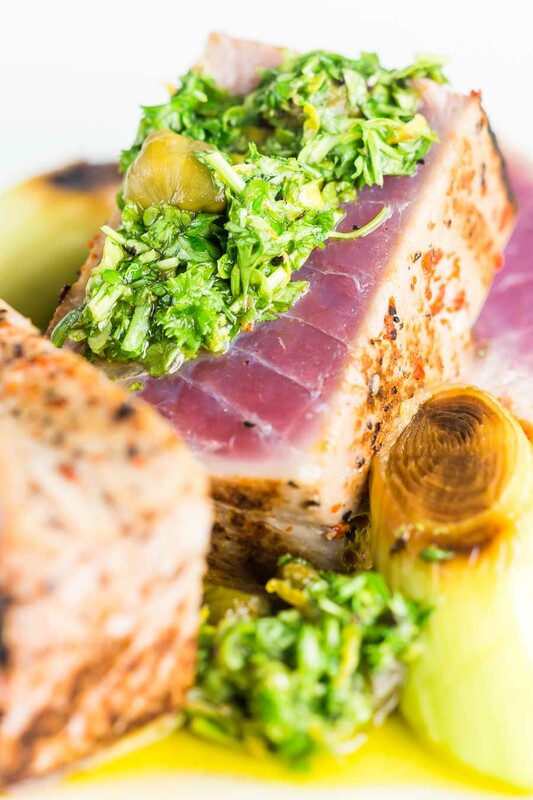 This seared Tuna Steak Recipe certainly goes bold. Many people think of European food as bland, nothing could be further from the truth. Of course the bold spices are not as prevalent, but these bright citrus flavours and sharp capers are anything but bland. Bright and Zingy Lemon Caper Sauce. For most of my readers a lemony caper based sauce is probably most familiar in a Chicken Piccata. That is typically lemon butter caper sauce, this one however is built on lovely peppery olive oil. 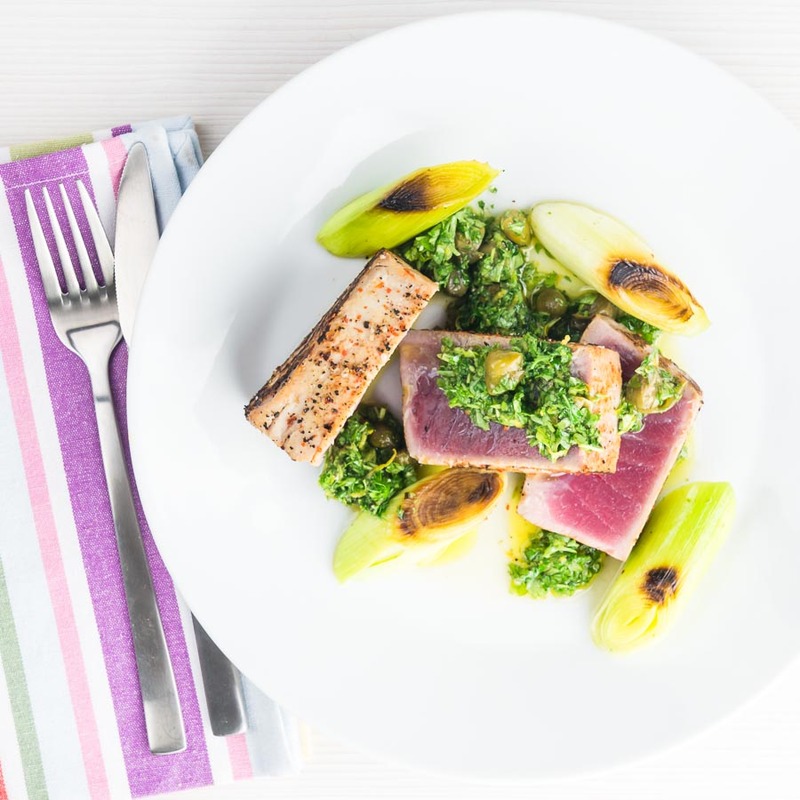 Choose your olive oil well for this seared tuna recipe because it really is at the heart of this sauce. You will know what you like so go for something that really floats your boat. This also features parsley as a core ingredient… Not a sorry sprinkle of the stuff to give a brown dish a bit of colour. Once again the flavour of parsley will shine through in this sauce, that is why we get that part of the recipe going first. It gives the flavour a chance to all melt together. In other news, my parsley in the garden is going great guns, so expect to see my chimichurri sauce get an outing just as soon as I can find some rump steak. 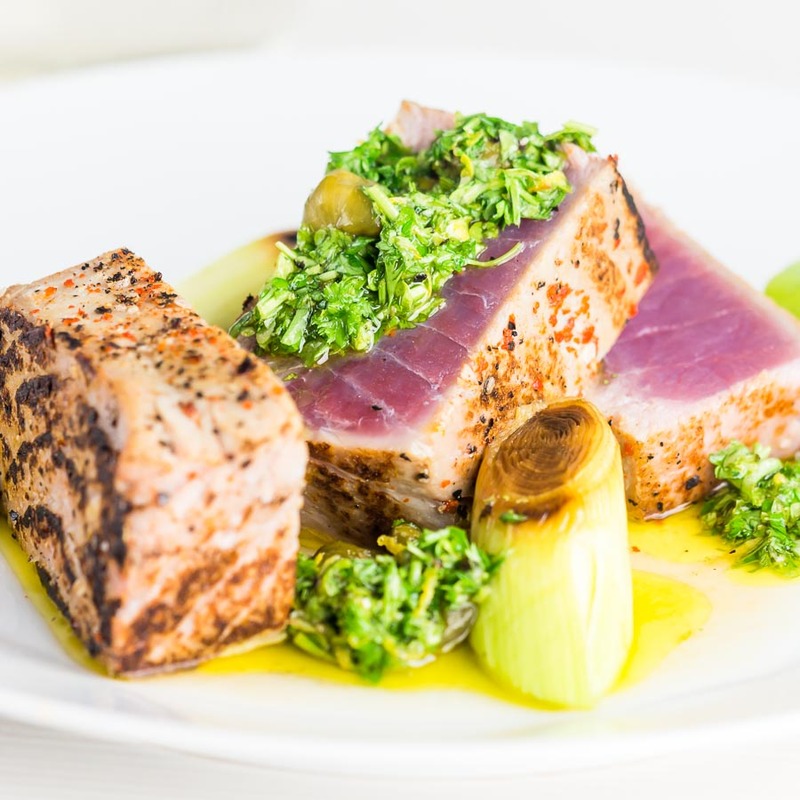 Rich and magical tuna steak works so well with zingy sauces and this lemon caper sauce loaded with parsley certainly qualifies as zingy... It is all done in 25 minutes too! To begin with, remove your tuna steaks from the fridge cut into a large cube and allow to come to room temperature. Prep all of your vegetables and herbs and then mix all of the ingredients together for the sauce and taste adding seasoning as required. Take a large frying pan and heat over a high heat and then add the tablespoon of olive oil for the leeks. Sear the leeks on one of the cuts sides for a minute or two then flip. Pour in the stock and reduce the heat to low, then add a lid and allow to braise whilst we cook the tuna. Take the tuna steaks and season generously with salt an pepper on all sides. Heat a large non-stick pan over a fierce heat. 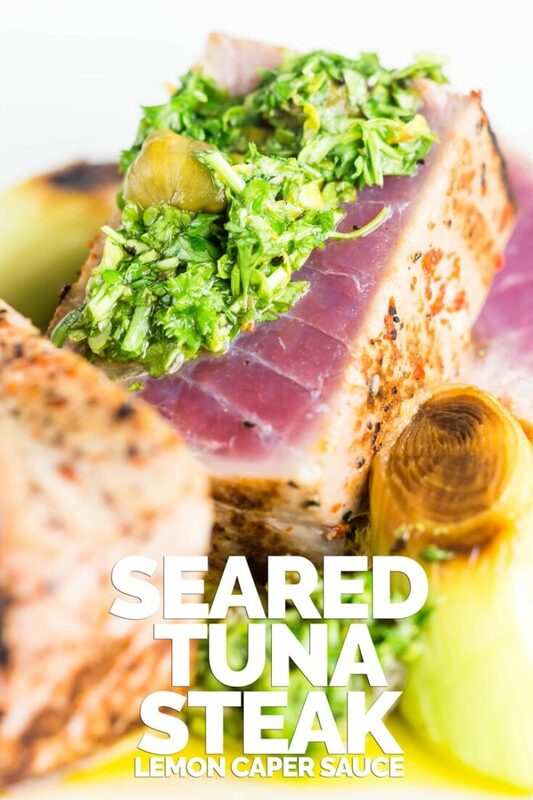 Sear each of the six sides of the tuna steaks for a maximum of 60 seconds on each side. When seared sprinkle with the chili flakes all over if you are using them and allow to rest for 2 minutes before carving. Drain the leeks then plate, begin by carving the tuna steaks into three, add sauce to the plate, add the tuna and leaks. Complete with more of the vibrant sauce. That lemon caper sauces sounds so light and flavorful! Perfect for spring! The flavours in this dish sound amazing. A perfect blend to go with the tuna. A great dish to enjoy in the summer sun. 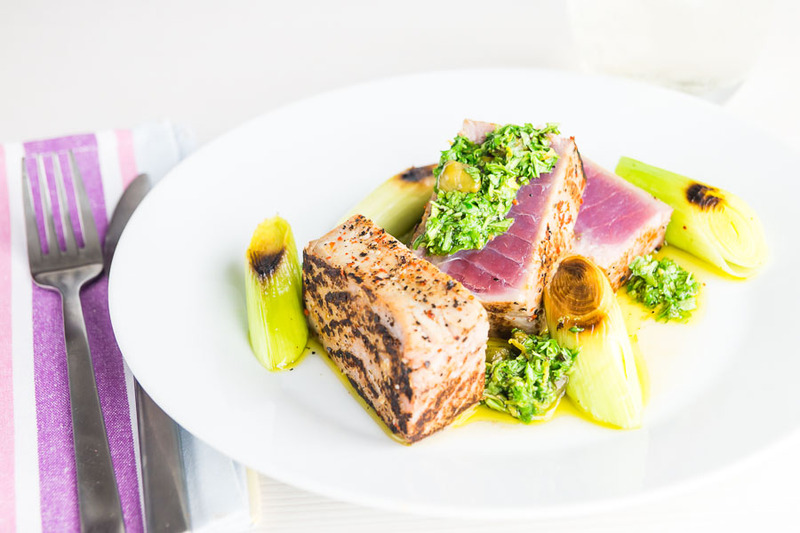 I love leeks and like the idea of pairing them with tuna and lemon, such a great combo. We love Tuna Steak over here! It’s one of our favorites…but I bet that lemon caper sauce takes it to an entirely new level!! What a delicious looking tuna steak, love the flavours. They sound like they really compliment the fish.